Dallas Cosmetic Dentist Terrel Myers, D.D.S. Dr. Terrel R. Myers’ mission is to improve the quality of life of his patients through excellent, state of the art dentistry. Dr. Myers wants to help them keep their teeth their whole life in maximum comfort, function, health, and appearance. 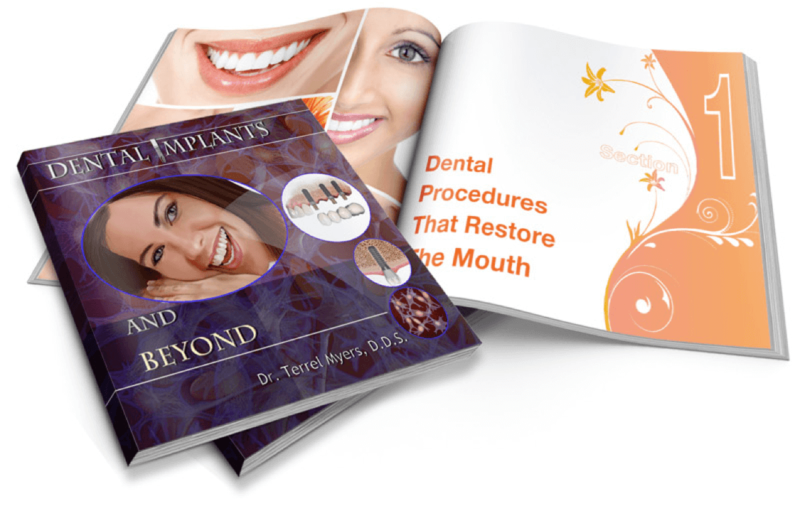 Dr. Myers even wrote a book, Dental Implants and Beyond, to help his patients become better educated on dental health. Dr. Myers can help you achieve the smile you’ve always wanted and keep it for a lifetime. Outside of Dallas Laser Dentistry, Dr. Myers enjoys spending time with his lovely wife Arlene, children, and grandchildren. Dr. Myers provides patients with full general dentistry services including dental exams, crowns/bridges, implants, dentures, and other services for restoring and maintaining oral health. Dr. Myers has often lectured at local Dental Societies and Dental Study Clubs, helping to share his extensive experience on optimizing “bite” and cosmetic dentistry with both new and experienced dentists. He has been at the forefront of dental technology in Dallas for decades and is a perfect fit at Dallas Laser Dentistry. Dr. Myers received his Doctorate of Dental Surgery from the University of Missouri – Kansas City School of Dentistry after earning a Bachelor’s of Science from Oklahoma State University in Physiology/Pre-Dental. He has had extensive training in occlusion and restorative dentistry through the Pankey Institute for Advanced Dental Education in Florida and through Pete Dawson Seminars on Occlusion. These post-graduate courses focused on how to help patients maintain their teeth for a lifetime, as well as maximizing the life of cosmetic dental work for maximum value to the patient. After serving in the U.S. Air Force as a Captain in the Dental Corps, he maintained a successful private practice in Dallas, Texas, for over 30 years before joining Dallas Laser Dentistry. His practice focuses on cosmetic, restorative, and implant dentistry to give his patients their dream smiles, while optimizing each patient’s bite to maximize comfort and longevity of the restorations. He’s been named a “Super Dentist” several times by Texas Monthly (most recently in 2014 – 15), while D Magazine has named him “Best Cosmetic, Restorative, and Implant Dentist” (2011/15) and “Best Family & General Dentist” (2013) in Dallas. He has also been named to Who's Who in America Executives & Professionals (1996 – 1997) and honored as a Top Dentists in the U.S. (1999). Dr. Myers is a member of the professional organizations ADA (American Dental Association), TDA (Texas Dental Association), Dallas County Dental Society, Dallas Study Club, Dallas Implant Study Club, and is a Fellow of the Academy of General Dentistry. His memberships help him give and receive advice and training on the changes occurring in modern dentistry. His background may sound very technical, but the smiles he helps to create are truly beautiful and that’s what his patients appreciate. Experience does make a huge difference, particularly when it comes to maximizing the value each patient obtains from their investment in restorative and cosmetic dentistry. So if you want to get your dream smile or just maintain it for a lifetime, set up an appointment with Dr. Myers today. Dr. Terrel R. Myers, D.D.S. applies his years of training and experience as an exceptional general and cosmetic dentist at Dallas Laser Dentistry.